No really, I spelled that correctly. You see, we have a crocodile called Smaug in our garden. 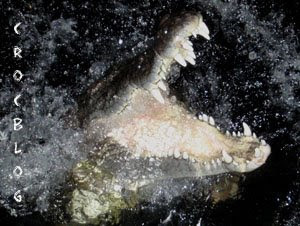 He's a 14.5 foot (4.5 metre) long Australian Saltwater Crocodile. We called him that because, well, he looks like a smug dragon that could be sitting on a large mound of golden coins. For those that don't immediately see the references, that's what Bilbo Baggins finds the dragon Smaug doing near the end of J.R.R. Tolkien's The Hobbit. Considering that Peter Jackson and Benicio del Toro are producing the movie version of the book at the moment, we thought of sending them Smaug's audition tape. He's quite a dynamic presence, as you can see from the photograph (thanks to Graeme Sawyer). Oh and incidentally, the board that we used to carry Smaug on when we built the enclosure? That's the Smaugasboard.